The defense establishment bolstered forces across the West Bank Tuesday, following the murder of Eviatar Borovsky. Most specifically, the IDF and police reinforced presence near the Yitzhar settlement, where Borovsky resided, for fear that settlers would initiate revenge-induced violence. Following the terror attack, in which Borovsky was stabbed by Salem Za'al, 24, forces of the IDF's haredi battalion raided Za'al's residence at the village of Shucha near Tulkarem. Meanwhile, Za'al, treated at the Rabin Medical Center in Petah Tikva for mild injuries he sustained after being shot by the IDF, is under investigation by security officials. The defense establishment is also fearful that the attack could incite the region into a third intifada. Settlers and defense forces have been clashing all through Tuesday, with Palestinian vehicles and homes stoned and fields torched. Police arrested ten people for rioting. "This could be a long night," said a police source, "but we're prepared for any scenario that might occur and will work to keep the peace in both sides." Over the day ten people were arrested during the West Bank riots. 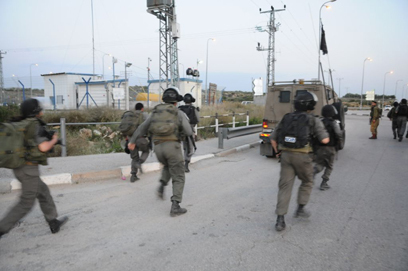 See all talkbacks "Security forces fear settlers' revenge for Tapuach murder"